Zenith is known in the industry as a second or third-tier manufacturer - meaning the company brands their products through an OEM (original equipment manufacturer) from Taiwan, China, or Korea. Second and third are typically price point pieces - trying to offer good value for the money with the ultimate sacrifice of quality. Rarely though do such products get it all right in terms of industrial design, picture quality, and reliability. Zenith's Z23LZ5R 23-inch LCD TV is no exception. The Zenith Z23LZ5R LCD Television gives users exactly what they bargained for: poor picture clarity, non-uniform blacks, and questionable design. That is not to say that this low-cost, LG-manufactured display doesn't have its strong points. Out of the box users will find accurate color, respectable sound, a DVI input and a valuable collection of cables. Still, people who want to fully enjoy their DVDs and TV will probably want to look elsewhere. The Zenith LCD TV ultimately sacrifices video quality for a low price. Color on the Zenith Z23LZ5R is reddish at the factory settings, but turning the color setting down a little yields accurate and respectable hues. Brightness is suitable for a well-lit room at the default setting. Brightness can't be turned up without totally washing out the picture. Users can select from pre-set picture settings optimum, soft, and clear. Optimum is a professional setting where colors are true. Soft makes the already ill-defined image even less precise and clear is the setting halfway between bland true color and overly saturated color that most non-video-professional users would gravitate toward. Picture clarity from a DVD drive over component video was flat out disappointing. Small HDTV LCDs, like the Zenith Z23LZ5R, have very high pixel density, so there is no excuse for the poor clarity we saw on this display. The display does a particularly horrible job of clearly rendering text and fine lines that appear in video. With this LCD's 550:1 contrast ratio blacks were dark enough. Unfortunately the display was marked by non-uniformity in its blacks. Instead of having a crisp, uniform black bars across the top and bottom while displaying widescreen movies, the Zenith Z23LZ5R's blacks looked like the nighttime sky with New York's light-pollution bouncing off the clouds back at you. I learnt to ignore this problem while watching movies, but watching the blotchy screen during the TV's 10-second startup will always remind you of this shortcoming. The TV handles both 4:3 and 16:9 sources on its 1366 x 768 native resolution. The built in tuner is fast, but it is NTSC-only and won't decode HDTV signals. Using an external tuner and feeding in a 1080i signal into the TV via component cables resulted with a passable picture that was less precise than what is available on other LCD TVs. Owners of this TV will not obtain the benefits from the HDTV resolution because of the Z23LZ5R's inability to render a crisp image. An EDTV display adjacent to our Z23LZ5R displayed the same content with greater clarity than the higher-resolution Zenith Z23LZ5R. Three aspect ratios are supported, but strangely all crop the sides off of a video signal from our DVD player - so much having a widescreen TV to preserve the artist's vision. The 16:9 setting will give an undistorted widescreen image; zoom stretches the screen and makes images appear taller; 4:3 is used for 4:3 sources. There is no picture-in-picture capability. The Zenith's 16-ms response time is enough to render most fast-motion scenes respectably, but not enough to keep artifacts from slipping into the fastest scenes. The 16-ms response time wasn't an issue using this display as a computer monitor. Stationary text from my laptop's DVI output displayed crisply at 1280x768 on the Zenith. I found using the Zenith Z23LZ5R as a computer monitor was straightforward, more so than some LCD TVs from many first-tier manufactures. The picture quality from computer inputs was crisper than some first-tier displays for general business software. Still, people considering using this display as a primary computer monitor should be aware that the Z23LZ5R's anti-glare technology is worse than LCD TVs from other manufactures and, most likely, worse than what you'll find on any decent dedicated LCD computer monitor. As a television, off-center viewing resulted in visible drops in color and increases in glare. 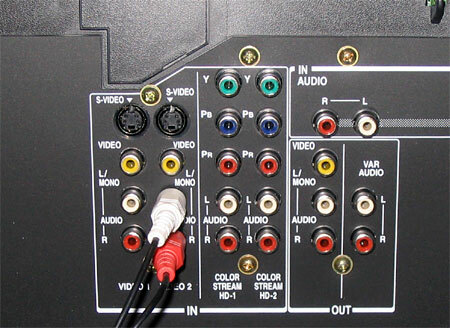 The Zenith LCD TV does include a comprehensive set of inputs. The Zenith comes with an impressive set of inputs for its size and price. There are two sets of component inputs, a coaxial cable/antennae jack, an RCA-type composite video input, and composite S-Video input. One of the coaxial cables only supports a 480i signal, so you won't want to use a progressive-scan DVD player with that jack. The display also comes with a DVI input and a DVI-to-DVI cable and VGA-to-DVI cable - two expensive items by themselves. There is no HDMI input. The 14-watt sound system puts out plenty of clear sound and the display's bulb and electronics are inaudible - there's no hiss or whine when the TV is muted. Users can choose from preset sound modes or individually adjust different frequency ranges using an on-screen equalizer. Changing the settings didn't produce marked changes in sound and the TV sounds fine with just about any setting. 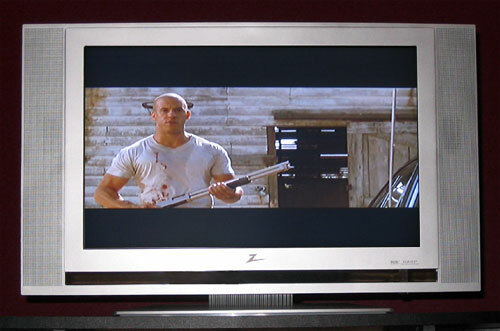 The Zenith Z23LZ5R LCD HDTV can normalize volume across channels by turning on the AVL feature. The included remote control, which only operates this television's feature set, is narrow and easily held, but it won't win any style awards. With the stand the television is just less than 9 inches deep, 18 inches tall and 29 inches wide. A cable corral and cover are on the back and should be used, lest you want to see your cables through the transparent plastic on the front. Power consumption is a modest 120 watts and heat vents off the top. This LCD TV is made in Mexico. You'll find this LCD Television going for around $900 on the street. A few hundred dollars more will get you a better 23-inch display from a respected manufacturer like Sony or Toshiba. A nice collection of inputs can never compensate for a sub-par picture that you'll suffer through for several years. If you are investing your pennies (and your bills) in a LCD Television, skimping on this low-cost TV is a big waste of money.